Who's hyped for the new Star Trek movie? 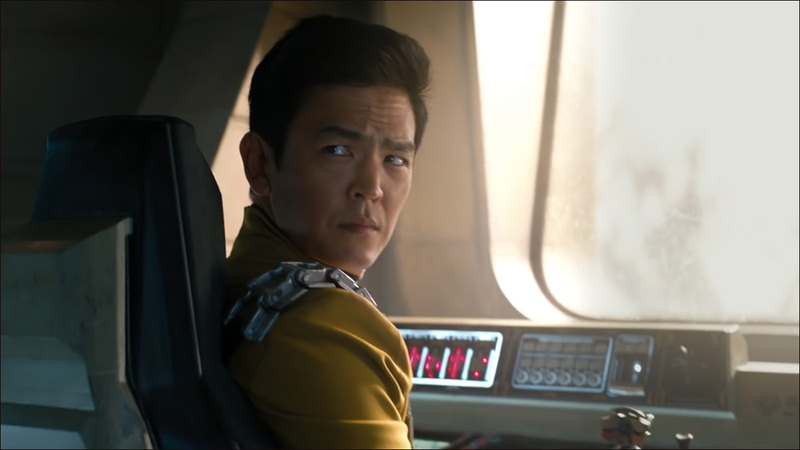 For those clamoring to see John Cho back in action as Hikaru Sulu in Star Trek Beyond, here's a little taste. This recently released quick-cut 15-second character promo puts the spotlight on the USS Enterprise's intrepid helmsman, who brings just the right amount of Starfleet swagger, confidence and raised eyebrow when it comes to jumpstarting alien spacecraft. I certainly hope we'll see Sulu get a little more to do this time around. He's had a handful of a great moments between the first two movies, but of all the main crew, Sulu's arguably suffered the most from a lack of screen time. Cho says Star Trek Beyond marks an "evolution" for the character. "To me, there has definitely been an evolution in Sulu," Cho tells SciFiNow. "In the first film, it was an evolution from the TV series where you got to learn a lot about him while you saw him be much more active than he was on the show. And then you saw his leadership abilities take a leap in Star Trek Into Darkness when he took command briefly. And in Star Trek Beyond, you see him as a family man with personal stakes in this battle that involves the universe. So there's definitely an arc there." Star Trek Beyond, directed by Justin Lin, hits theaters on July 22.